News on three solo shows caught our attention this week--all firsts for these artists. Two are by Manila-based artists, GORI and NUNO who are known to reign in the urban jungles of Metro Manila with their wheatpastes, and tags, throwies, and pieces, respectively. We featured GORI a while back in an interview and covered him when he was still starting with paste-ups. His Gorilla character have shown up in a many incarnations and sizes in and out of the metro. After 5 years of working in the streets, it may be high time for him to do a gallery show and he has found the opportunity to do it in Secret Fresh this year. The show's title "GO! REACH THE SKY" is clearly a word play on his street name "GORI". But it could also be a declaration of claiming his goal. Whatever it may be - fame/fortune or just the fuel to keep his passion for creation, is only as far as he makes it. 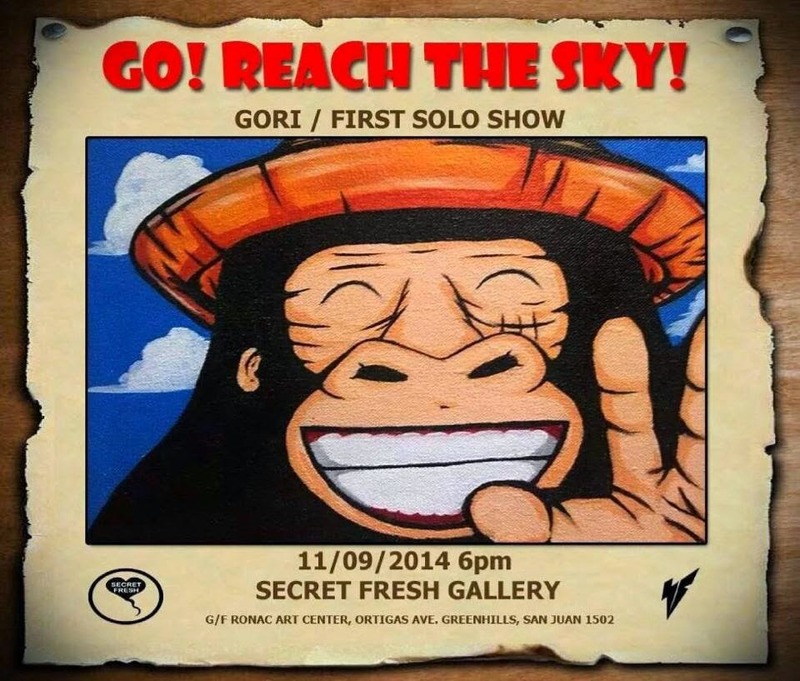 GORI's first solo show opens on November 9, 2014 at Secret Fresh, G/F Ronac Art Center, Ortigas Ave., Greenhills. Another solo show to watch out for is graffiti king of the North, NUNO's "Also Known As" under his other moniker "Adrian Alfonso". 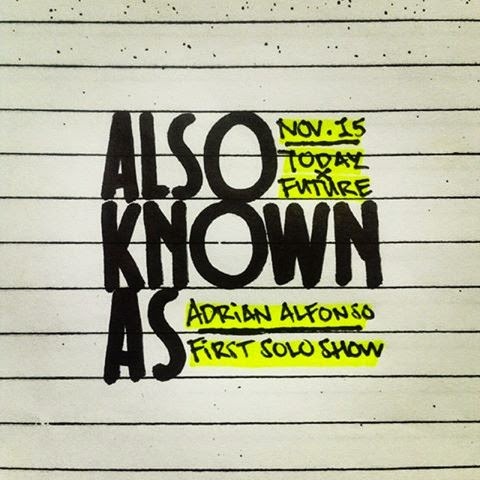 We can only wonder what Adrian Alfonso has in store for us in this exhibit. Will he be showing us another side of him that is removed from his graffiti roots? Or a side of his artistic practice that stems from his graffiti roots? "Also Known As" opens on November 15, 2014 at Today x Future, Cubao City. Down south, a graduate of Communition Arts from UP-Mindanao and a graphic artist and photographer, Mishael "El" Pueblas, is mounting his first solo show at Ayala Abreeza Mall in Davao City from November 10-23, 2014. 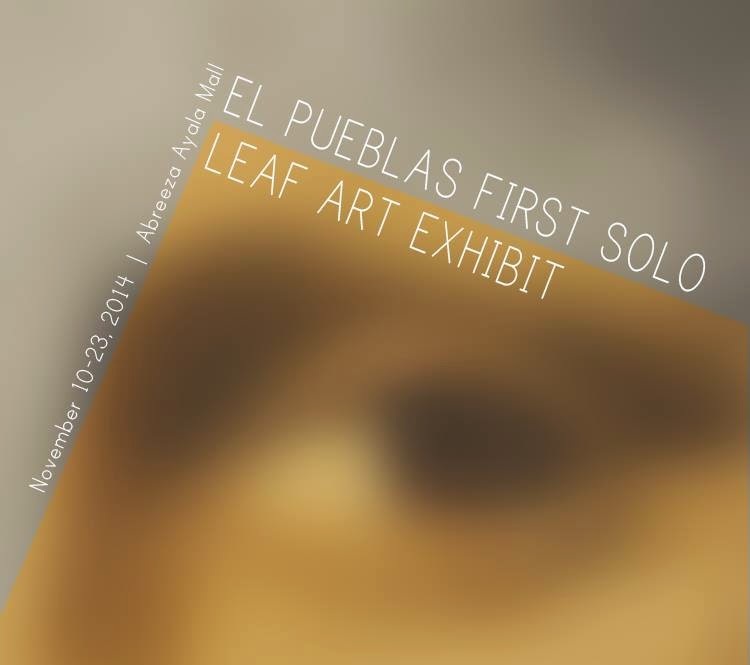 His first solo show will focus on leaf art, a medium we have yet to see more of.